The Professional Beauty Association’s North American Hairstyling Awards (NAHA) is pleased to announce that Shawn Trujillo and Angie Katsanevas, owners of Lunatic Fringe Salons, have been named NAHA winners in the new Salon MBA category. This marks the inaugural year for the Salon MBA (Masters Business) award, which was designed to recognize savvy salon owners who have cultivated a cutting-edge salon and a highly profitable business. Shawn and Angie are also the co-owners of Paul Mitchell The School – Salt Lake City. If you’re a Shear Genius 3 fan you’ve watched Janine Jarman for the past nine weeks cutting, coloring, blow drying, brushing, curling, pinning, extending strands and turning out spectacular hairstyles in a very limited amount of time. Who will ever forget her first Elimination Win in Week One when her stunning blonde Nymph from the sea floated down the runway strutting her gorgeous cloud of blonde tresses. It was a WOW moment. Janine also completely transformed a frumpy man into a hunk using HairUWear hair extensions. The bubbly competitor also created a picture perfect bob on a model with naturally curly hair. Of course Janine has had a few misses, but for the most part she has come in either as doing Shear Genius work or being a close second. Her performance on the reality TV show has been stupendous. While you might think you know Janine from her Shear Genius 3 performances, you may surprised with the real Janine. I have known Janine since she opened her fabulous Hairroin Salon (www.hairroinsalon.com) located at 1553 North Cahuenga Boulevard in Los Angeles, California (90028-7312 – Phone (323) 467-0392). Before the third Season of Shear Genius started, insiders were projecting that Minneapolis hairdresser Faatemah Ampey was going to be the Diva of the Hairdresser Darlings and even possibly take away the $100,000 prize. Alas, it was not meant to be. At the end of the third episode, Faatemah has sent packing. Why? There wasn’t any one reason, but if you study the three episodes she was on the show, a pattern does emerge. Don’t get me wrong. I am a Faatemah fan. I had the immense pleasure of meeting Faatemah at the NAHA awards in July of 2010 where the lovely and charming Faatemah graciously accepted her award for Best Fashion Forward designs. So why was she cut from the hairdresser reality show on Bravo? As a licensed hairdresser who also have been focused on consumer hair issues since 1997 I believe I have a unique perspective on both sides of the chair. The very first short competition the Shear Genius contestants had to do was compete in a Punk To Polished Makeover. They had just two hours to transform some of the most over-the-top hairstyles I have ever seen gathered in one room. All of the 12 contestants had to each pick a red scissor box and inside the box was a number. The number inside the box determined the order that you picked your client. 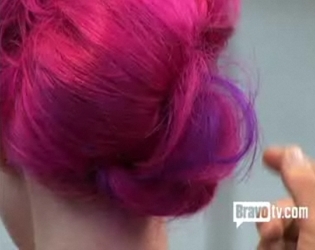 When Faatemah picked the young woman with the bright pink hair I wondered what she had in mind. Faatemah hugged her model who said “yeahhh” when she was picked and took her off to begin the transformation. Did she plan to color her hair or just work with the existing pink hue. It’s important to remember that they only had two hours for their Punk To Polished transformation. Jonathan Antin visited Faatemah at that point and said “you’re going with a different plan now?” Faatemah said “yeah” as she continued to work. Jonathan said “I’m worried about you because there isn’t a lot of time left.” Jonathan walked away to talk to other competitors. Jonathan didn’t mince words. He said “I think this is a little bit on the messy side. Especially for kinda a Vintage vibe. It’s supposed to be perfect clean, at least in this area” and he pointed to the back of the updo which had a large curl. When it came time to announce the results Jonathan announced the bottom three. He called Faatemah’s name first. He said “Faatemah, your hair was messy, it wasn’t clean, it wasn’t polished at all and you were second guessing your work.” The other two in the bottom three? Janine and Brian. 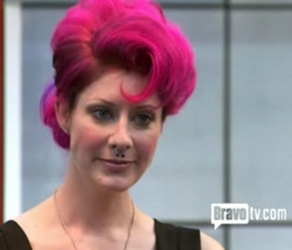 Ironically Amy, who Faatemah said was doing a “hairdresser’s cheat” with the asymetrical cut was in the top three. The winner was Amy for doing as Jonathan said “a great job.” Jonathan pointed out that Amy had to deal with a headful of dreadlocks which required a lot of work. I will confess that while I watched Bravo’s previous Shear Genius Seasons, I was very excited to see the new Season Three for a number of reasons. First of all, I have personally met two of the contestants, Janine Jarmon and Faatemah. I have known Janine for some time having met her right as she was opening her famous Hollywood Salon, Hairroin. I met Faatemah in the Summer of 2009 at Cosmoprof in Las Vegas. Faatemah was a winner in the NAHA hairdressing awards and her work was stunning. I was lucky enough to interview her after her win. She was lovely and very modest about her work. In addition to having met two of the contestants, I am a huge fan of the work of Master Haircolorist Kim Vo and of Orlando Pita who is truly a hair icon. Of course I am curious to see what role Jonathan Antin will take as one of the new judges. Various guest judges are also expected to drop in over the course of the season including world famous Oribe and Bravo’s Tabitha. 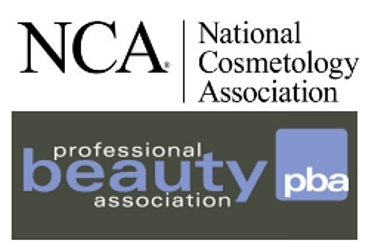 The Professional Beauty Association (PBA) and the National Cosmetology Association (NCA) released an announcement that the two organizations have signed an agreement to merge, effective immediately. 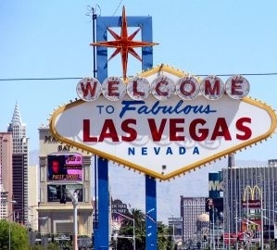 Cosmoprof North America (CPNA) 2009 is kicking off this weekend (July 18 – July 21) in Las Vegas, Nevada at the Mandalay Bay Convention Center. The goal of the spectacular convention, in its seventh year is to offer the professional beauty industry (salon owners and manufacturers) business growth solutions and resources to help with the current difficult economic trends. CPNA is expected to attract executives and buyers from some of the largest and most prestigeous beauty and hair distributors in the world.